In the next few months, the Brookline Department of Public Works is expected to propose changes to solid waste collection, the first since so-called “single stream” recycle carts were delivered to households five years ago. This time the department is expected to supply carts for general refuse. The word so far is that the cart capacity might be 35 gallons or less–far smaller than most cities and towns provide. Standard waste containers: The past several years have seen a trend toward cities and towns in Massachusetts supplying waste bins or carts rather than expecting residents to provide them. In Brookline that began in 1990 with 12-gallon “blue bins” supplied by Laidlaw, Inc., when it began to collect and process Brookline’s second-generation, multiple stream recycle waste. Twenty years later, Brookline switched to “single stream” recycling operated by Waste Management, Inc. Flatbed trucks distributed a 65-gallon cart with wheels to each participating household. Although little publicized, on request Public Works will supply a 35-gallon or a 95-gallon cart instead. As of 2014, at least 56 of the 351 Massachusetts cities and towns were supplying waste carts to residents, according to municipal solid waste survey reports available from the state’s Department of Environmental Protection. The 1.1 million households in those communities are nearly half the state population of 2.4 million households. For recycle waste, 49 communities provided carts. For general refuse, 37 communities provided carts. Seven communities provided only carts for general refuse, while 19 communities, including Brookline, provided only carts for recycle waste. All data are from the state survey report for 2014 except for Newton and Bedford, which did not report that year; their data from 2013 were used instead. Cart sizes: Capacities of most solid waste carts are rated at about 65 or 95 gallons. A few towns use other sizes, including about 25, 35 or 50 gallons. 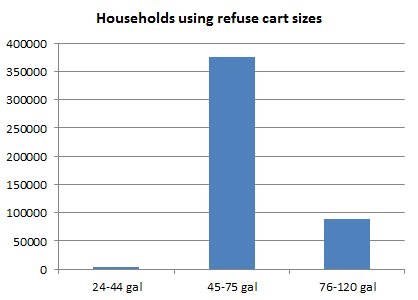 Weighted by the numbers of participating households, the statewide average capacity of a cart for general refuse was 69 gallons. 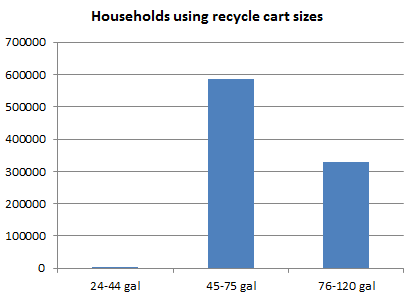 The average capacity of a cart for recycle waste was 75 gallons. A solid waste cart size of 35 gallons or less would put Brookline far outside the mainstream practices of Massachusetts cities and towns. Only the two small towns of Hamilton and Wenham provide carts for general refuse in that range of capacity. They represent less than one percent of households participating in Massachusetts programs with municipally supplied carts. Advisory Committee member Stanley Spiegel wrote, stating that Hamilton and Wenham operate food waste collections for composting, separate from general refuse. So far, Brookline is not known to be planning any similar program. This entry was posted in Environment, History, Services on October 9, 2015 by Craig Bolon.